OK, you’re probably thinking that is an oxymoron. How can your board be too involved? Many of you would do an awful lot just to get your board involved at all. But, as my sister always tells me, beware what you wish for. An involved board can become too-involved, and a too-involved board can create chaos. It might be that your board member(s) are used to micromanaging their staff, their kids, and now, you. Or they are “doers” and think that by doing all this stuff, they are helping. Mainly, however, it is because they do not understand board roles and responsibilities. Frequently, they confuse regular volunteer jobs with things that they, as a board member, should be doing. And while it can be great to have a board member also volunteer to do non-board member things, they have to understand the differences in roles. Board members lead the organization. They define strategic directions, provide high-level oversight, and ensure the financial integrity of the organization. Volunteers are a lot like unpaid staff. They do the tasks that the organization needs to get done. When it is a board function, the board is in charge, at the helm, the leaders of the organization. When it is a volunteer activity, a staff member is in charge, and the volunteer does as the staff requests. When these two roles get conflated, too-often the board member takes charge and while that may sound wonderful, the reality rarely is. For example, right now I am working with a client on their end-of-the-year appeal package. In August (when I was hired), I created a timeline, showing each step and the date by which each step would be done. The copy for the letter(s—we have segmented out 5 groups), the reply device, follow up postcards, e-blasts, social media postings are all written. But the pulling together of the lists and getting the letters printed, collated, and ready for mailing, which should happen by the end of this week, has been put on hold. The board members (almost all of them) want to edit the letter before it goes out. Do I have to tell you what a bad idea this is? Beyond the obvious issue of group-write, which is inevitably disastrous, there is the little issue of time. I pointed this out at the board meeting where this issue raised its ugly head. Well…….not so much when it comes to arm’s length techniques. That is the staff’s role. The board should be identifying potential major donors, helping to cultivate them, asking them for gifts (or getting the staff in front of these prospects so they can make the asks), and then ensuring that the donors feel really good about the gift they made. They should not be holding up a critical part of the annual fund. But, just as I can’t simply blame board members for not doing their jobs, I can’t fault them for trying to do too much. What is needed is clarity—for both the CEO and the board members—about their roles and responsibilities. In the case above, the Board simply did what the ED asked. She brought the package forward and asked if they wanted to do this. If she wanted to ask that question (and honestly, it’s not a question I would recommend), then she should have done that in June, before anything was written and planned. And if the board says no, then the CEO has to ask the next question: How, then, are we to raise money? The problem with that question starts with the reality that most board members will give a knee-jerk answer: Let’s have an event. It continues with the fact that almost assuredly, none of them are fundraising experts. And it ends—as alas, too many nonprofit stories do—with the organization strapped for money and unable to move its very important mission forward. Janet Levine helps to move nonprofits from mired to inspired and helps them to raise more money to accomplish their important mission. Learn more at www.janetlevineconsulting.com. While there, sign up for the newsletter and contact Janet to schedule your free 30 minute consultation. And while you are at it, learn to become fluent in fundraising. 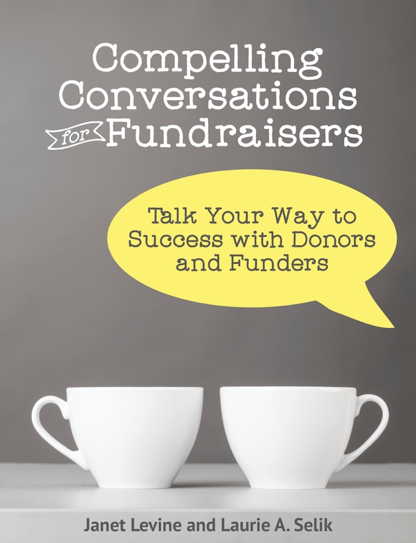 Compelling Conversations for Fundraisers is now available at Amazon. This entry was posted in boards, fundraising and tagged board roles and responsibilities, boards and fundraising. Bookmark the permalink.